Sydney caters for all ages: Sun-lovers head for the beaches; families can explore the attractions of Darling Harbour; gourmets delight in the restaurants at The Rocks; adventurers can climb the iconic Harbour Bridge; while the less active can stroll the magnificent Botanic Gardens. Sydney is also a popular gay holiday destination, especially during late February when the annual LGBT Mardis Gras takes place. Sunny Sydney is one of the world's top holiday destinations, offering stunning beaches, vibrant nightlife, superb shopping and delectable restaurants. And beyond the iconic landmarks and cosmopolitan pleasures of the city, many beautiful natural landscapes beckon travellers keen to explore the Australian great outdoors, making Sydney a great travel hub. The most popular time to travel to Sydney is during the summer months, between November and March, when it is constantly hot and sunny. Winter in Sydney (June to August) is mild but damp, and nights can be chilly. Read more on Sydney's Climate and Weather. -Explore Darling Harbour, Sydney's hottest tourist district. -Interact with some of Australia's most loveable animals at Featherdale Wildlife Park. -Catch a show or take a tour of the iconic Sydney Opera House. -View the city from the staggering heights of the Sydney Tower. -Bask in the sun on one of the many glorious beaches in or near Sydney. -Climb the famous Harbour Bridge for stunning views of the city. -Stroll around Sydney's beautiful Royal Botanic Gardens. -Enjoy the good restaurants and historic buildings of The Rocks. New South Wales is chock full of remarkable natural landscapes and those on holiday in Sydney have an array of daytrip or excursion options: The Blue Mountains and the Snowy Mountains are playgrounds for outdoor enthusiasts; the historic mining town of Broken Hill attracts many visitors; and the vineyards of the scenic Hunter Valley just beg to be explored on a roadtrip. New England boasts many beautiful landscapes, and Byron Bay, on the north coast, promises pristine beaches. Kingsford-Smith Airport, often just called Sydney Airport, is the starting point for many New South Wales holidays. The airport is situated just six miles (9km) south of the city. 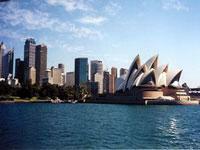 Get more information on Airports in Sydney. -The Sydney Harbour Bridge is the widest and tallest steel arch bridge in the world. -George Street is the oldest street in Australia. -Sydney boasts the deepest natural harbour on Earth. Sunny, seductive Sydney is a high contender for the title of the world's most ideal city. It is slick and smart, the streets are clean, the parks sublime, the water in the huge harbour bright blue, and the landmark buildings breath-taking. Sydney's population is approaching five million, but it is easy to leave the frenetic urban pace behind with just a simple ferry ride to the North Shore for a bush walk, or a stroll along the harbour beaches, or any one of a number of daytrips to explore the 'real' Australia on the city's doorstep. Just like its characteristic white-sailed Opera House, Sydney seems to cruise effortlessly through nights and days filled with myriad entertainment opportunities, sophisticated shopping, memorable museums, and strings of beautiful beaches. Visitors find it exhausting to take it all in, even though the tourist precinct where most of the interesting attractions are to be found is concentrated in quite a small area around the downtown waterfront and harbour. The fact that Sydney is a thriving seaport and industrial city has been cleverly concealed behind attractive pleasure and leisure grounds and residential suburbs, making full use of the scenic, watery geographical location. The harbour area is dominated by the span of one of the world's largest arched bridges, backed by towering skyscrapers. It is all a far cry from the remote penal colony established by the British back in 1788. Another plus for visitors is that compared to most big cities Sydney offers excellent, reasonably priced food, accommodation and public transport. The city also has an excellent suburban rail network, with its hub at Circular Quay in the city centre, and full use is made of the waterways with ferries and passenger jet boats plying to and from various points. To the north of Sydney is the Pacific Coastal route, which passes beautiful coastal scenery, laid back seaside communities like Byron Bay, and excellent surf, with nearly 249 miles (400km) of beaches to explore. Whale watching is popular in season and the region is also dotted with numerous national parks and nature reserves that offer activities from hiking to kayaking in the Myall Lakes. The Waterfall Way, which winds up to the New England Tablelands, is one of the most scenic drives in the world, taking in the vineyards of the famed Hunter Valley. To the south of Sydney is Australia's only alpine habitat in the Snowy Mountains, where winter skiing is the main attraction. In summer the mountains become a playground for whitewater rafters, fishermen, kayakers and hikers.